You go for you annual check-up and the doctor comes to examine your teeth and informs you that your tooth with a very large filling is fractured and can no longer going to support your tooth structure. The good news he tells you is that there is a long term solution to save the tooth by performing a crown procedure. But what is a crown exactly and how much will it cost you think to yourself? 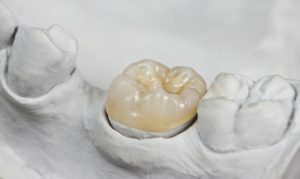 Well a tooth crown (also known as a cosmetic dental cap) is a type of cosmetic or restorative dental application that completely covers or encapsulates your damaged tooth. There are many reasons why you might need a dental crown. I encourage you to read our other blog post Do I really need a dental crown? 5 reasons why you may need one to better understand the different reasons why you might need a crown placed on your tooth. So how much does a crown cost? Dental insurance coverage varies according to the type of plan and the level of benefits that you have elected. Most insurances provide an annual amount of maximum coverage and then you have to pay for any expenses above that amount. Dental insurance might cover a certain percentage of the cost if the crown is needed for medical reasons, but dental crowns are typically not covered if they are considered cosmetic, and many dental plans have an average maximum annual coverage limit of $1,000-$1,500. Our team can provide an estimate before doing the procedure. Our practice accepts most dental isurance plans. We offer a payment plans through Care Credit which offers low-interest methods of financing dental costs over a period of time and accept we accept payments via major credit card (Visa, MasterCard, Discover and American Express). It’s important to remember that dental crowns are a long term solution and an important investment in the overall health of your teeth. When the procedure is complete we will give you instructions on how to care for your new porcelain crown during your visit. Don’t forget that regular brushing, flossing and dental visits will add life to your teeth, tooth crowns, and any other dental restorations. If you would like to schedule a consultation, appointment or have any questions about dental crowns please call our office at (703) 860-8860 or email us atpremierdentalcare@gmail.com. Comments Off on How Much Does a Dental Crown Cost?